Port of Oakland: Private Industry or Public Agency | Reimagine! In the United States, there are 361 public ports. The Port of Oakland, the fourth largest, processes about $30 billion of exports and imports annually. Oakland’s enormous cranes, unloading gigantic ships, mean a lot of money is changing hands. But critics say local communities are being short-changed on benefits and plagued with negative impacts. “It’s not a private business, it’s a public agency and its revenue is not profit. It belongs to the people.” So says Rob Smith of Urban Strategies in Oakland. Short-changed on the benefits but plagued by the Port’s negative impacts—it’s the harsh reality of life in West Oakland, an area hardest hit by the health impacts of port operations. Residents fear that port expansion plans will only bring more pollution from the additional diesel-burning trucks, ships, and trains into their neighborhoods—and into their lungs. The Port of Oakland also runs Oakland International Airport and 19 miles of bayside real estate that includes office parks, shopping areas, restaurants, and luxury apartment complexes. It is by far the largest agency in Oakland city government, but it makes economic and policy decisions without direct public accountability, thanks to a 1927 law that made the Port independent of the city. Recent property sales by the Port have some community advocates wondering about the future of Oakland’s waterfront neighborhoods, and questioning whether the Port should retain its autonomy. West Oakland residents—who face increased cancer risks, higher rates of asthma, and greater susceptibility to heart attacks—want something done about the pollution caused by the Port. 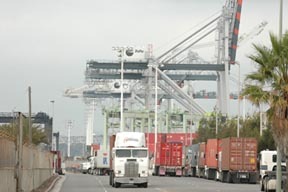 A boom in international trade has forced an overhaul of the Oakland waterfront, claims Port spokesperson Marilyn Sandifur, adding that the import/export volume is expected to double in the next 15 years. “We have a seven billion dollar annual impact on the region and affect 44,000 jobs, so it’s important that we… keep up-to-date with the kind of improvements and enhancements [needed],” says Sandifur. Most of the air quality programs at the Port of Oakland stem from a 1998 legal settlement involving the Port’s Vision 2000 expansion plan. Nearby West Oakland residents were concerned about air pollution from the proposed expansion. Noting that roughly 20 percent of children in West Oakland suffer from asthma, one local activist alleged that the Port’s activities were “literally killing us.” The Golden Gate Environmental Law and Justice Clinic took the Port to court on behalf of West Oakland residents. The Port settled with a $9 million Air Quality Mitigation Plan, the most stringent diesel exhaust mitigation plan ever proposed by a port up to that point. The plan includes nine measures, some of which reduce pollution from other sources in the community to make up for increased emissions from Port activities. The implementation of the measures is guided by a technical review panel composed of representatives from the community, regulatory agencies, and environmental groups. Excerpted from the Natural Resources Defense Council Report Harboring Pollution: The Dirty Truth about U.S Ports. Despite community concerns, the Port keeps on growing. Even the harbor is growing. “We’re deepening [it] to accommodate [the] larger ships in order to keep Oakland a significant international gateway, and keep the economy of the Bay Area… going,” Sandifur says. The Port is certainly profitable, raking in over $250 million a year. A small, but not insignificant portion of which—approximately 11 million dollars this fiscal year, according to Harold Jones, Port Communications Director—comes from real estate development on public land. Last year, the Port caused a furor when it made a last-minute change to an environmental impact statement and approved construction of a Wal-Mart in East Oakland within 30 days—with no public input. It caused additional public concern when it offered the property developer, Simeon, a $10 million dollar loan of public funds, characterized by Mr. Jones as a deferred payment. The Port is already a major source of air pollution. Research by the West Oakland Environmental Indicators Project and the Pacific Institute, shows that trucks traveling through West Oakland to the Port daily produce as much toxic soot as 127,677 cars. 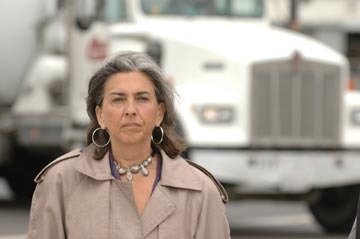 West Oakland residents face greater cancer risks, higher rates of asthma, increased susceptibility to heart attacks, and many other adverse health effects resulting from living on a thoroughfare for trucks between three major highways and the Port of Oakland. But Wal-Mart is a natural ally of the big business board members at the Port. It is a member of the West Coast Waterfront Coalition, which united with the shipping lines against labor during a 2002 lockout. It is also at the receiving end of the international supply chain that Sandifur celebrates as the engine for economic growth. It is no coincidence that those diesel trucks that pollute West Oakland are usually carrying sweatshop manufactured goods to Wal-Mart and other Waterfront Coalition members like the Gap, Home Depot, Target, Best Buy, and Payless Shoes—all low-wage landmarks of U.S. retailing. What might surprise many is that despite the money the Port makes commercially, because of a 1927 State Tidelands Trust law, the Port does not pay taxes. Instead the City receives payment for services rendered. Port spokesperson Sandifur says that they will pay approximately 15 million dollars this year for services like police, fire, and Lake Merritt maintenance. She points out that Port tenants also generate sales tax revenues in the tens of millions and parking and utility taxes of 6 million dollars. The Port is run by an unelected board of seven members, nominated by the Mayor and confirmed by the Oakland City Council for four-year terms. At a recent but typical meeting of the Port’s real estate committee, chaired by John Protopappas, a well-known developer and political ally of Mayor Jerry Brown, only four minutes out of one hour and 20 minutes were open to the public. The rest of the meeting was taken up by closed door sessions about development projects and leases with private real estate interests, such a Harbor Partners, Ellis Partners, Simeon, and Hensel Phelps. Exactly what sort of give-and-take the real estate deals include is confidential, but as long-time Oakland watcher Douglas Allen-Taylor points out in his column at the Berkeley Daily Planet, the Port real estate committee seems to use a different kind of math. When Jack London Square was losing money for the Port, they sold off the profitable parcels to Ellis Partners and kept the money-losers. The needs of Oakland residents are considered—if at all—only after the deal is signed and only if the community protests loudly enough. All too often, the remediation efforts are minimal and delivered through a community benefits agreement. These agreements rarely change the basic structure of a development deal. The few gains tend to be weakly-enforced, unless the community maintains constant vigilance. In most other Bay Area cities, developers pay impact fees and build “inclusionary” affordable housing as a matter of law—even on private land. But in Oakland, 60 acres of public land is changing hands for a mere $18 million on a project estimated to be worth over $500 million—with no guaranteed public participation in determining public benefits. The developer involved, Signature Properties, claims that there is no subsidy involved and that it is exempt from existing local hiring agreements and other modest requirements of city-subsidized development. According to Wollenberg, Oakland had to fight hard in the early part of the twentieth century to gain back some control of its port from the powerful railroad. To appease the various interests and still isolate it from politics, the Port was made a semi-autonomous entity. But to most people, the rationale behind the Port’s special status makes no more sense today than it did then. Another major problem with the Port’s auto-nomous status is that it often ends up competing with the established, locally-owed businesses. Some believe that every time the Port succeeds, the rest of the city loses, says Wollenberg. Instead of the city supporting the landmark Holmes bookstore, that used to be on 14th street, there’s a waterfront Barnes and Noble on Jack London Square. The Port is well aware of these criticisms, says spokeswoman Sandifur, quickly pointing out that the Port takes pride in its Community Relations Department, which channels money into pay back projects for the city, such as college scholarships for low-income students, and spaces like the Middle Harbor Shoreline Park for public recreation. Wollenberg and other Oakland Port scholars, however, contend that the Port could have been just as successful and profitable even without its special autonomous status. And despite the community projects it showcases, activists want to know why the Port cannot be more responsive to the health and economic concerns voiced by the residents of Oakland. Council member Nadel says that even commissioners with progressive credentials seem to undergo a transformation once they take their seats. Their community interests are overwhelmed by a requirement that they defend the Port’s bottom line. Ports around the country have varied relationships to their cities. Some, like Oakland, are semi-autonomous; others pay city taxes. Given Oakland’s current budget problems, there is no reason why old laws cannot be changed, say Oakland community activists. The Port, after all, is located on public land, and the pollution it creates is a public hazard. The community would like to see the Port be more of a city asset and less of a private business. Ben Jesse Clarke is a freelance writer and the editor of Race, Poverty and the Environment. Hana Baba reports for KALW Public Radio’s News and Up Front programs in San Francisco. She covers social justice issues, ethnic communities, and arts. Photos: Oakland City Council Member Nancy Nadel addresses a demonstration in West Oakland. (c) 2005 Scott Braley. Download or view a pdf of this article (200 KB).